Feast your eyes and carve into this beauty. 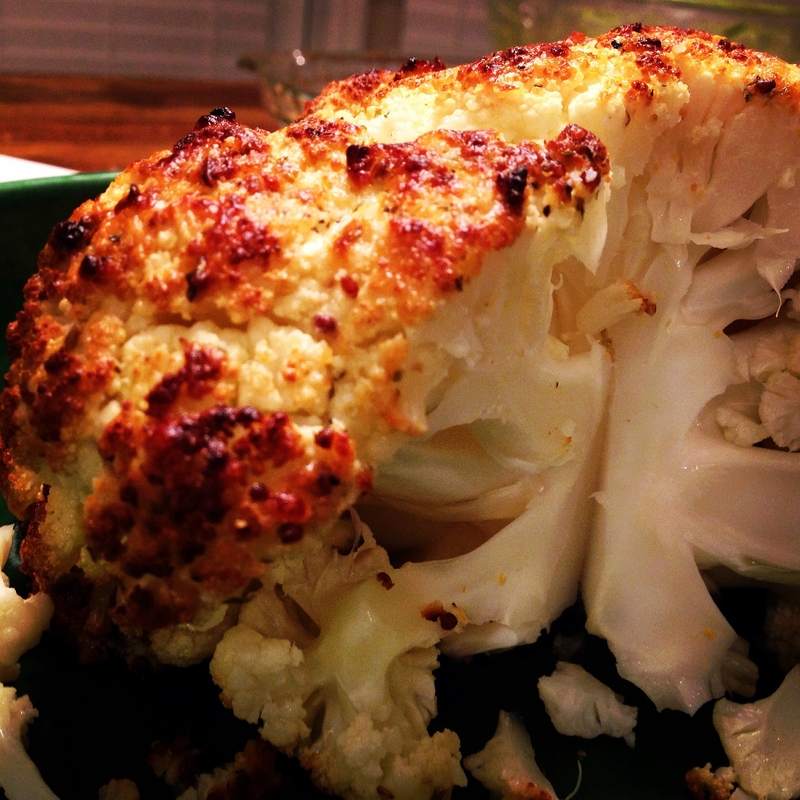 There is something grand and elegant about an entire head of cauliflower golden and speckled. Carving into it is fun too! 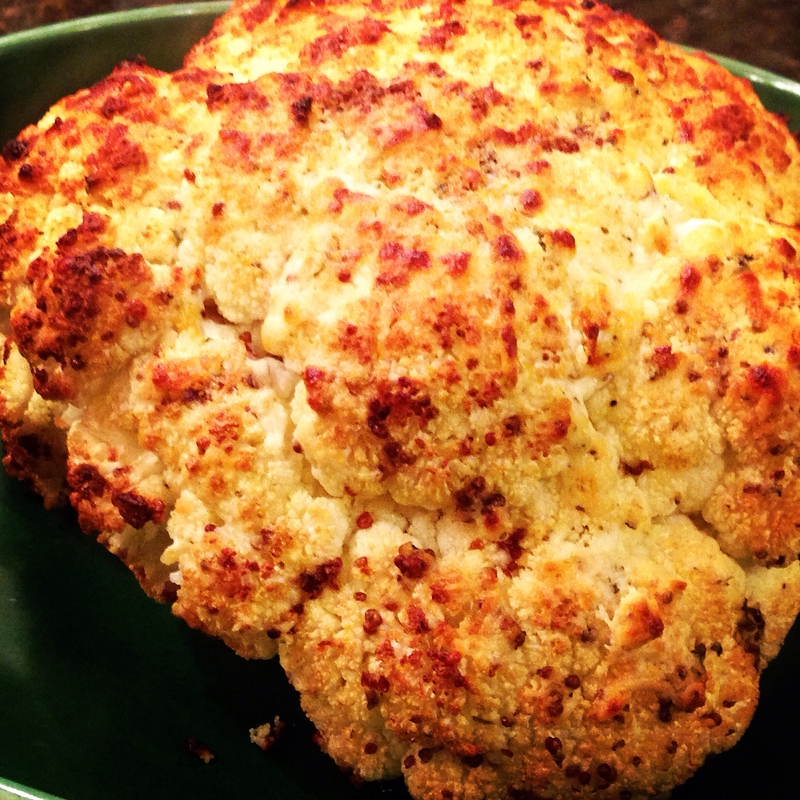 The cauliflower absorbs the herbs, olive oil, and spices well making every bite delicious. Although it is baked for over an hour at high heat, it never gets overcooked and retains a nice bite. Everyone at Thanksgiving and other celebratory meals will be impressed by the presentation and the taste which is reminiscent of garlic bread. YUM. 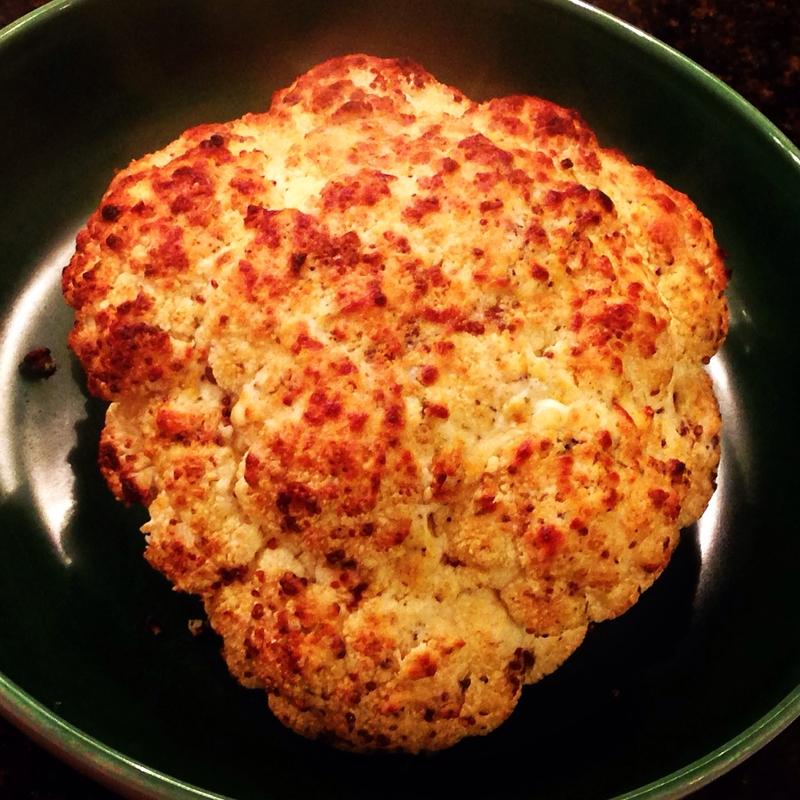 A few years ago, my friend Kathryn told me how to she used seasonings and goat cheese on a cauliflower and that it was a big hit at her book club dinner. It took me this long to attempt it myself. What a shame. I like to peel the leaves off and cut the stem down so that it can sit more stable. I was hesitant to use mustard thinking it may be too tangy and but everything ended up going really well together. I think the mix of the marinade and doing a second rubbing really helps it all meld and seep in. Carve out roasty, toasty chunks and dig in! 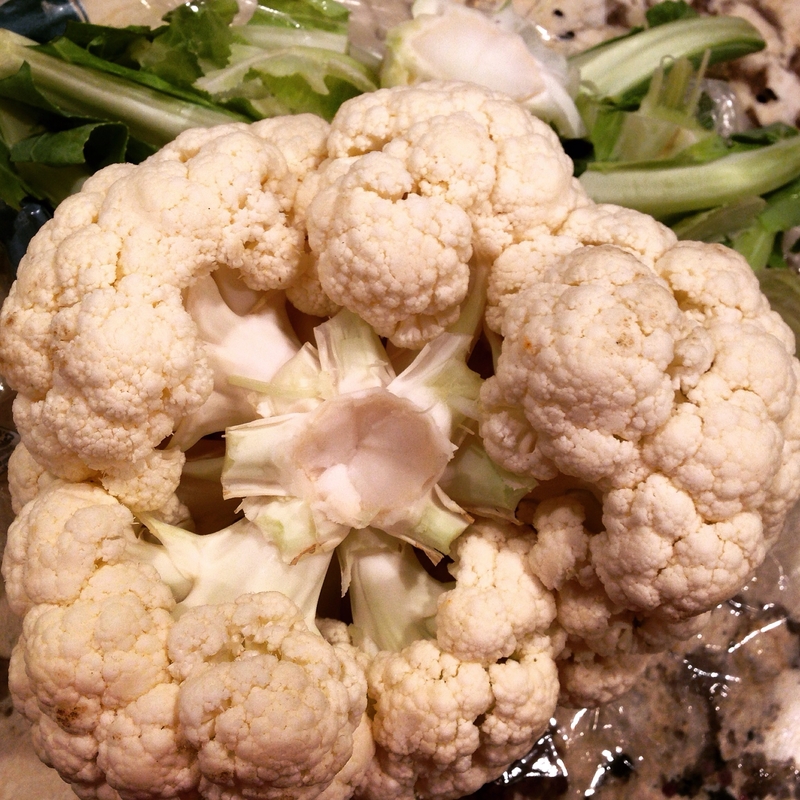 Remove leaves and as much of the stem as possible from the bottom of the cauliflower. Mix together olive oil, garlic, mustard, cumin, salt, and pepper. Brush or rub all over cauliflower trying to get as many curves and crevices coated as you can. Place in parchment lined or greased baking dish and bake for 1 hour. In a small bowl, combine butter, goat cheese, parmesan cheese, oregano, and garlic powder. Remove from oven and brush or spread on the butter mixture. Bake for 12 more minutes and then broil for 3 minutes. OMGosh this is sooooo good! That is wonderful to hear, thank you! Made this on Monday and it was perfect. Jake and I polished off the whole thing just between ourselves! I appreciate the feedback and I’m so glad you both liked it!